A unique window into the world of Cajun music between 1928 and 1965. Compiled histories from websites, books, news articles, liner notes, and interviews. Most come from my personal 78 collection. Also covering Creole, Cajun-Country, and Cajun swing. On January 22, 1925 in New Orleans, an "operatically trained physician from St. Louis, Missouri" named Dr. James Frederick Roach came to the Junius Hart Music Co. and recorded 2 songs for Okeh. Roach was a socialite doubling as a part-time musician during frequent radio appearances in New Orleans. One of the 2 songs was an African Creole lullaby sung in English. Originally from Missouri as well, Okeh's director of recordings, Ralph Peer, had traveled to New Orleans to record him during the session which ran from the 22nd to the 23rd. The interest in these recordings don't become apparent until an archived article is discovered in "The Talking Machine World" magazine, Vol 21, Page 12, posted on July 15th, 1925, which makes the bold claim that one of these songs is "the first recording of a Cajan folk song". The name is "Guè Guè Solingaie" (Song of the Crocodile). On the record's flipside is Agnes' "Reflets Dans L'Eau". The first recording of a “Cajan” folk song for OKeh records has been made by the Hart Piano House, Southern jobbers for the OKeh line. The “Cajans,” or Arcadians, have a type of music all their own. They are the descendants of the French colonists banished from Grand Pre by the British after the cession to England of some of the French holdings off the Canadian shore, near Newfoundland. These people have lived along the Louisiana bayous, weaving and spinning and raising the peculiarly tinted cotton made famous in the cloths they weave, and the dialect they speak and the songs they sing in the fields and over the cradles are heard only in the bayou country. As portraits of bayou life they are real poetry, connoisseurs say, telling stories of the strange water creatures that inhabit the bayous, and the uneventful life of the fisherfolk. 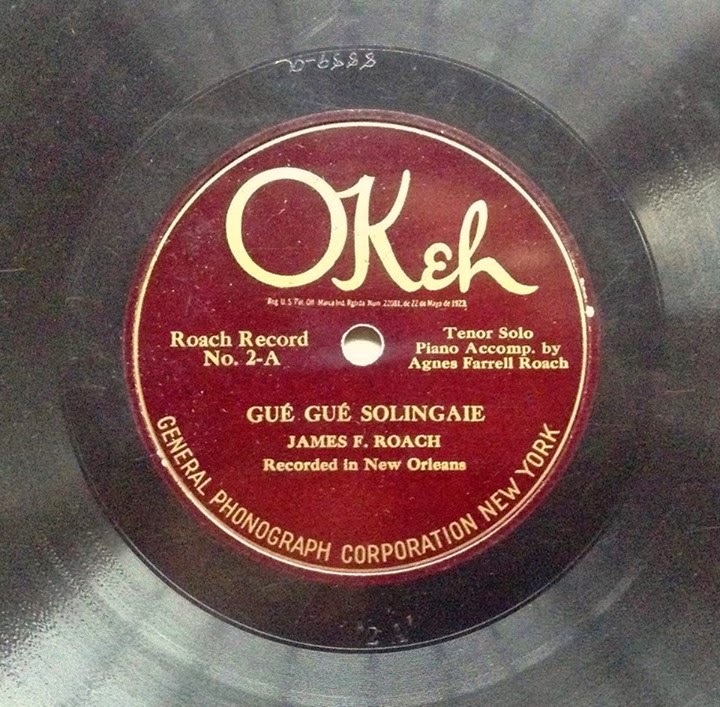 The initial record is “Gue gue Solingail,” or “Song of the Crocodile.” It is sung for OKeh by Dr. James F. Roach, a New Orleans non-professional, who is gaining a widespread reputation for amateur and radio appearances. The success of the first recording will mean, it is believed, further experiment along the same line and the introduction of typical Cajan music and dialect lyrics to many music lovers, via the talking machine. The mystery deepens. For some reason, Okeh never released these (as far anyone can tell). According to blues author, Tom Tsotsi, believes the recordings were supposed to be Okeh matrix 8887 through 8889, however, no information shows Okeh releasing them and no one knows why. According to author Richard K. Spottswood, the Roach family released them with the label "Roach #1" and "Roach #2" independently on their own, probably with their own money. He did a session where he recorded some folk songs and opera pieces. It is in English with a classical piano backup. We have a partial label shot as well. [It has an] Okeh label on the 78 with an overlaid "Roach". We presented preliminary work on him at the International Country Music Conference and the Association of Recorded Sound Collectors. This version, sung in English, has been recorded by others using French lyrics. Dr. Roach was a medical surgeon that graduated from the Missouri Medical College in St. Louis in 1897 and practiced here. He was the chief surgeon at the asylum. He served overseas in France during WWI and later the Red Cross. He and his second wife, Agnes, moved to New Orleans, where he lived on Carondelet Street and worked at the US Public Health hospital. He was classically trained operatic tenor from the New England Conservatory of Boston and may have studied in Europe. 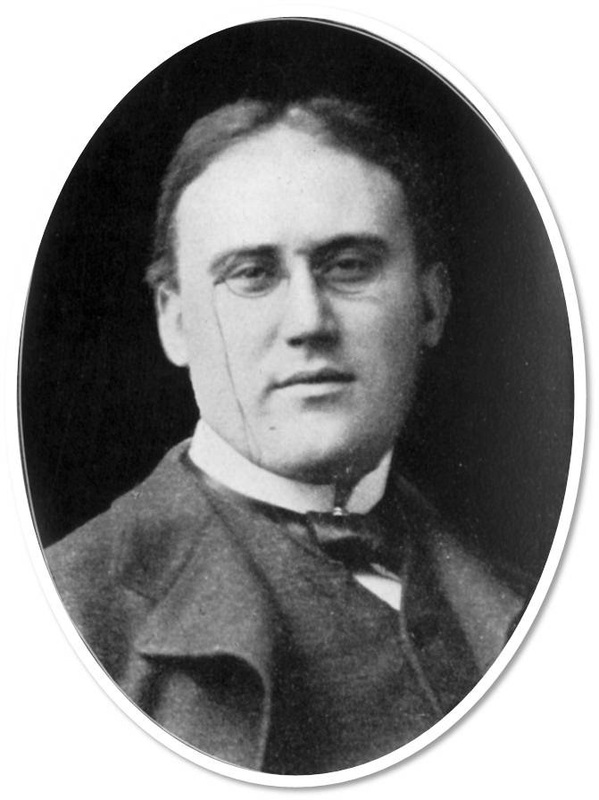 By 1907, he was touring throughout the US with several other opera companies singing operas in both English and French. By 1909, he stopped touring and became an instructor in Des Moine, Iowa and then Polytech College in Fort Worth, TX until about 1915 and returned to medicine. During the mid 1920s, he still was singing radio broadcasts in New Orleans. The song is actually a vernacular Afro-Creole song prevalent in the Crescent City area. Music writer Mina Monroe recalled hearing the song as a child from the domestics who worked on her family's plantation home in St. Charles Parish. In a 1921 publication "Bayou Ballads", she states that the song is almost an incantation, in which the ending pharase of each couplet, 'li connain parle', is whispered in hushed tones. In sort of weird lullaby, the little ones are urged to 'balie chimin-la', or to 'sweep the path clear'. The 'path' being the tiny mind preparing for dreams. A version of the song can be heard by the Kingston Trio, however, it's unknown if resembles Roach's recordings at all. Sweep the dream path clear! What the tortoise may have to tell! To the song of the crocodile! In the canebreak the wildcat cries! 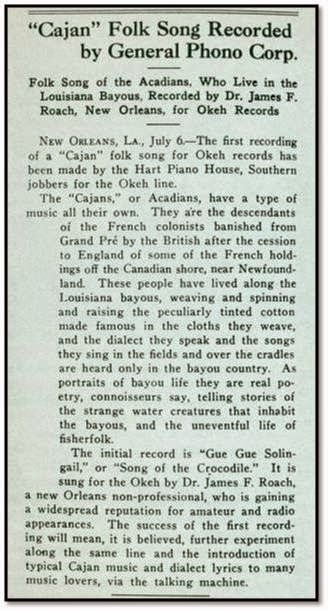 While this song is 3 years older than the official first Cajun recording, "Allons a Lafayette", being a Creole lullaby and having no ties to anything Cajun in origin, most believe this recording has little Cajun significance. However, even if it isn't the first Cajun recording, it is an interesting piece of Louisiana music history that almost no one knows about and it does excite the imagination. Gronow, Pekka. 1982 Ethnic Recordings: An Introduction. Ethnic Recordings in America: A Neglected Heritage. Washington D. C.: American Folklife Center, Library of Congress. Cohn, Lawrence. 1990 Cajun Vol.1. : Abbeville Breakdown 1929-1939. New York: Roots & Blues. Monroe, Mina, ed. Kurt Schindler, 1921 Bayou Ballads: Twelve Folk-Songs From Louisiana. New York: G. Schirmer, Inc.
2010 ARSC Conference Recordings. A Cajun Music Mystery: Dr. James F. Roach, "Song of the Crocodile," and the First Commercial Recording of a Cajun Folksong. Patrick Huber. Got info? Pics? Feel free to submit.